Delhi Metro is one of the many things that we Dilliwalahs are absolutely proud of. It has given us so much to be grateful for. Our hopes, dreams, and aspirations revolve around it and each time, a new track is added, it helps us breathe easier and adds to our confidence and trust in our nation as common citizens. Way back in 1997, when I travelled around in the U.S. during a company-sponsored training program, I never imagined in my wildest of dreams that one day those air-conditioned trains and gleaming marble floors of a Metro station would exist in my own country too. On 29 May 2018, at 6 AM, Delhi Metro’s much-talked-about Magenta Line from Janakpuri West to Haus Khas was thrown open to public. People like me from this part of Delhi who used to catch the Yellow line to their offices in Gurgaon from Rajiv Chowk earlier can now catch it from Hauz Khas, with travelling time reduced to half. I took my debut ride in the Magenta Line on the following day on 30th as 29th was my day off. The station premises had swanky, cool interiors with marble floors all through, a far improved version of metro stations built earlier. Being new, the floor was still very slippery. I was glad that I chose flat black shoes over heeled ones. All the Magenta line indicators had magenta patches on them. The marigold flowers and mango leaves draped all over the place during inauguration on the previous day still looked happily fresh. It took me three long, steep escalator rides deep into the earth’s belly to reach the platform. It has been said that they are India’s longest. People stood in orderly queues and quietly moved into the train once it arrived. That was another pleasant change from what one normally encounters at Rajiv Chowk Metro station. Here are some pics clicked during the excitement of my first ride in the Mageta Line. What’s wrong with this pic? Nothing. I can already imagine you rolling your eyes upwards and saying this. But through an insider’s eyes, a lot. Here are your clues. 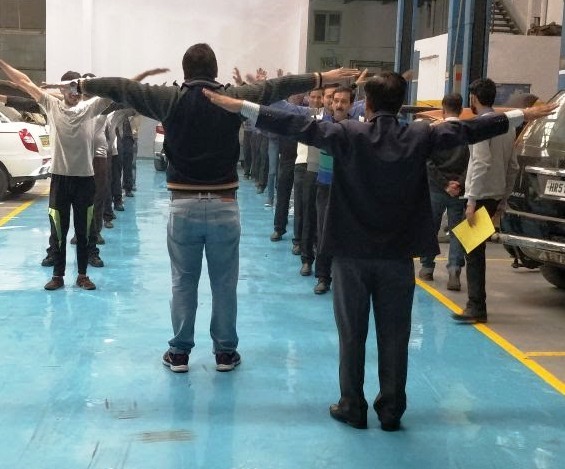 This photo is of a car workshop’s routine morning meeting with technicians, managers, and various support staff. The meeting is at the last stage where the technical staff routinely participate in a physical fitness exercise; which is a very good thing indeed. The guy in the center, however, the one in jeans and sports shoes, contrary to what you might think, is not a physical fitness instructor but the Workshop’s General Manager. Just before the exercises began, he gave a long speech on customer delight, proper grooming, and importance of coming to work in formal, clean uniform. While customers glared, puffed and fumed angrily at the vacant reception, as everyone was stuck in this meeting, this man refused to let go and rambled on for a precious half an hour, talking about things that could have been discussed later in some other forum. Well, now you get it, I am sure. Leaders often forget that it is not enough to point fingers at your errant subordinates. You need to lead through personal example; follow what you preach…Which is easier said than done. 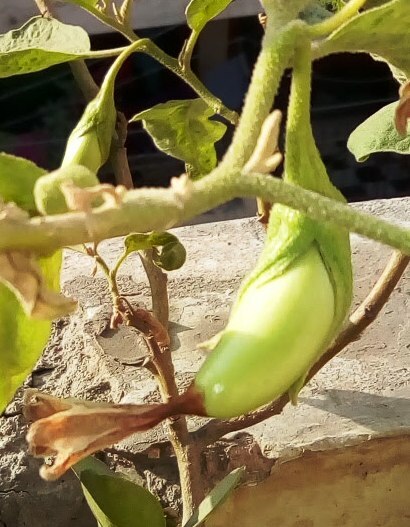 When white brinjals began appearing on a potted plant in my balcony, I was absolutely amazed as I had almost given up on it. Year after year, new flowers kept appearing, falling, and getting replaced by new ones, but the flowers just did not turn into any fruits, like one of those perpetually unlucky kids whom Success treats like outcasts. I didn’t have the heart to pluck these bringals, so I let them be. 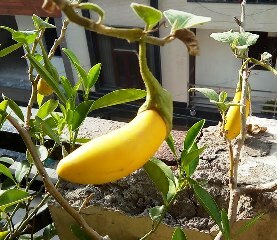 Now they are ripening and their color has changed into a bright, attractive yellow. See below. Their continued, tenacious presence in my balcony has a reassuring effect on me every morning while I water all the potted plants. I know it’s like holding on to something that I know will collapse one day. But that’s what life is all about, isn’t it? And here are some pics of a few other edibles that I plucked. On 12 May 2018, I was in for a big surprise…. I found 2 cardboard boxes in the kitchen when I reached home at night after work. My daughter Nanni (Nanni is her pet name) said, “Mom, these are for you, in advance. Happy Mother’s Day! I was really touched. After I reach home, I feel so hungry and tired that I just don’t feel like cooking at all. While we hugged each other, I realized how well she understood me and I silently thanked God for giving me a daughter as wonderful as Nanni. I quickly changed into my night suit and in the meantime Nanni laid out my treat for me on the table. See the pic above. Doesn’t it look gorgeous? I was a bit worried because when a grown up daughter says such things, you don’t really know what to expect. I tried to postpone the shock for a while. A few minutes later, with trembling fingers, I picked up the phone and opened WhatsApp. But I didn’t find anything new. When I raised my eyes, she came over and clicked on status. I once again thanked God for His blessings as I scrolled down through the pics. Wish you all, dear Friends, a Happy Mother’s Day!